Delo Group, one of the leading Russian stevedoring companies operating grain and container terminals in the port of Novorossiysk on the Black Sea, announces the acquisition of a 30.75% stake in Global Ports Investments PLC (Global Ports), Russia’s largest operator of container terminals. The deal, which was initially announced at the end of December 2017, was approved by the Russian Federal Anti-Monopoly Service (FAS) in March and was completed yesterday, 12 April. 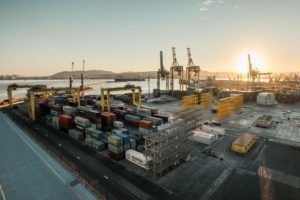 One of the conditions on which FAS accepted the transaction, was that all the stevedoring rates of Global Ports’ terminals, which are now set in US dollars, must be converted into rubles. With this decision, FAS confirmed the intention of the State to pursue the policy of changing port charges into the national currency, of which we wrote earlier and which may severely hit the sector, especially container and oil terminals. The 30.75% share belonged to Transportation Investments Holding Limited (TIHL), operating under the brand name of N-Trans, which is owned by Russian businessmen Nikita Mishin, Konstantin Nikolaev and Andrey Filatov, who in 2008 established Global Ports as a holding company. By that time, the Group consolidated 100% in Petrolesport container terminal in St. Petersburg, 75% in Moby Dik container terminal and in Yanino logistics centre in Kronstadt, 75% in Vostochnaya Stevedoring Company (VSC) on the Russian Far East, 75% in Finnish container stevedores MLT Kotka and MLT Helsinki, as well as 50% in Vopak E.O.S. oil products terminal in the Muuga port, Estonia. The year 2012 was a significant milestone in the history of Global Ports. The Group purchased the remaining 25% in VSC in Vostochny port from DP World, thus becoming the 100% owner of the terminal. Also, TIHL sold a 37.5% stake in Global Ports to APM Terminals, bringing global expertise of the Danish company in terminal development and operation. In 2013, Global Ports further enhanced its portfolio by acquiring 100% of the share capital of its rival National Container Company (NCC), the owner of St. Petersburg major terminals: First Container Terminal, Ust-Luga Container Terminal and the inland facility Logistika-Terminal. This deal worth almost USD 1.6 bln allowed Global Ports to grow into Russia’s leading container terminals operator holding around 30% of the total national container port volumes. In 2017, Global Ports’ total throughput was 1.37 mln TEU, up 6.9% to 2016. Delo Group is a big Russian private transportation and logistics holding company, offering a full range of services in the port of Novorossiysk on the Black Sea, including stevedoring, tug boats, vessels bunkering as well as multimodal freight forwarding using own inland terminals and warehouses. The Group owns NUTEP Container Terminal (capacity 350,000 TEU/year) and KSK Grain Terminal (capacity 3.5 mln tonnes/year).